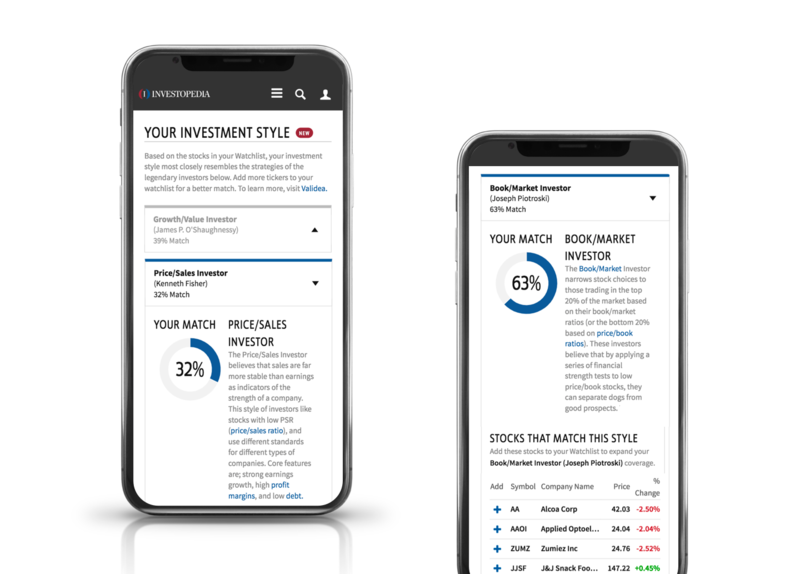 Investopedia was looking to enhance and drive more engagement with our stock watchlist product on the markets channel with personalized stock recommendations. 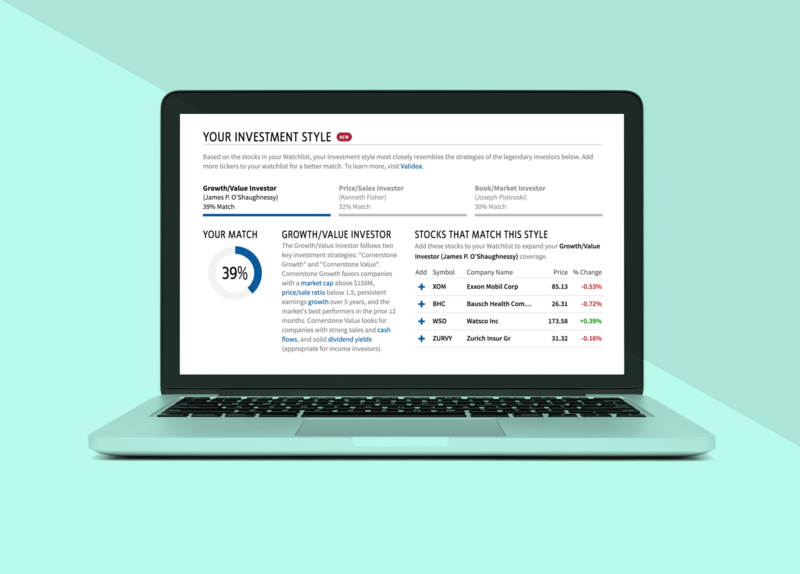 We teamed up with Validea, a service that provides predictive stock recommendations based on the trading styles of celebrity investors and gurus. We created a new feature for our users that would analyze the stocks in their watchlist and match them with celebrity gurus and their investment strategies. The product would also recommend stocks to add to the user’s watchlist that fit their trading style. The feature was a hit with users and drove up user watchlist engagement +53% within the first month. As soon as we began our partnership with Validea, we began brainstorming on ways we could leverage their service in our Watchlist product. I lead a design team consisting of a Sr. Product Designer, UX Designer, and UI/Frontend Developer as we collaborated with the Markets channel General Manager, Product Manager, Data Science Team, and Dev Team. As the design team lead, I was responsible for validating that each design solution met business requirements as well as user needs. However, my role was not limited to managing design operations, and I was also involved as an active contributor at each stage in the design process. Discoverability and data legibility would be key to providing our users with a meaningful experience delivered through a clean interface. 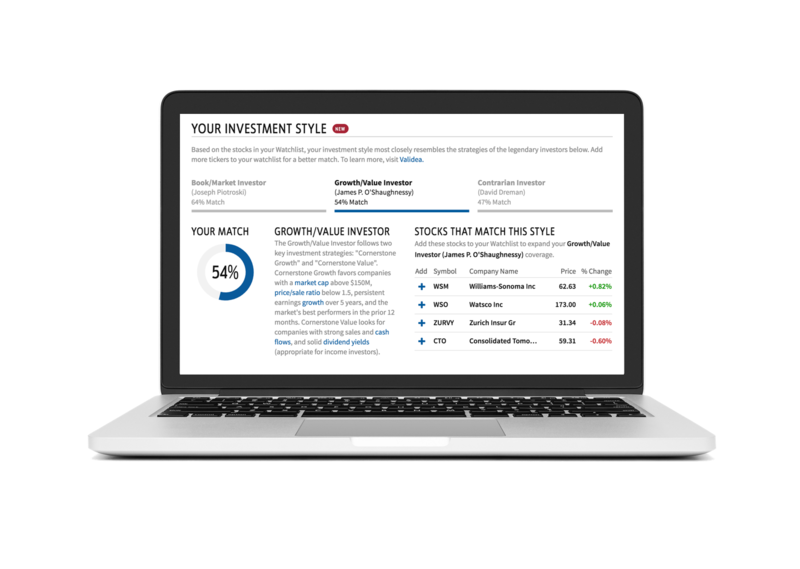 We also hoped the new feature would drive more engagement and interest in adding stocks to our stock watchlist. A major consideration of the project was handling data visualization, data tables, and complex interactivity as users added stocks to their watchlists and thereby affect the strength of their match between 3 celebrity investors. It was essential that the interface delivered a lot of information with clarity and that state changes resulting from user actions would be clear and easy to follow. We took a mobile-first approach to the responsive design. Our team benefited greatly from the multi-skilled expertise of a front-end designer and developer who could rapidly protoype in the browser. This enabled my team to test and adapt the UI based on feedback. The resulting interface is clean without sacrificing the depth of data or shortchanging interactivity. I also worked closely with the Markets Channel Product Manager to devise and implement an iterative testing plan to validate the Design Team’s proposed solutions at each stage in the process. We did a great deal of in-person testing as well as remote user testing with usertesting.com. By testing early and often, we were able to make informed design decisions and change direction as needed.